Working on the monthly budget and trying to get it to do what I want. Painful. And it's given me a crick in the neck; going to relax a couple on minutes and then rustle up some dinner for myself. Managed somehow to get Meredith interested in fountain pens (yay) and she picked up an interest in using my Sparkling Sands Jinhao x750 with the Goulet fine nib and converter, and is using a sample of Platinum Ink company's Black ink. Good taste, Mere! She said that she really liked the smoothness of the pen nib... I need to convert the other x450s I picked up with Goulet nibs and converters - the ones from Jinhao are OK, but the $15 fine nibs made for Goulet make them sing. She saw the two ink syringes I got from Goulet Pens, and wondered if I was into injectable drugs. Showing her how neatly (and cleanly) the syringe fills a pen's converter cartridge from a sample bottle fixed that idea. Jinhao x450 and x750s are dirt cheap for fountain pens; the government subsidies in China mean purchases on eBay are free shipping and - well, one x450 I picked up for $.99 and no shipping. Works fine. No base pen I have cost me more than $20 - two used Lamy Safaris, two Pilot Metropolitans, a Platinum Preppy (about $5) and two Jinhao x450s (both way less than $5). Why the number? **Different Ink Colors**. Black, Blue, Royal Blue (the color Susan likes the best, but she's not interested in the pens), Purple, 'woodland' deep Green, Red, and a Turquoise. I like them all. The ink prices are not bad at all, once you realize how long it would take you to go through a 80 ml bottle of the stuff. **Years**. My Black ink from Cross is from the last time I got into fountain pens, nearly 25 years ago, and I know a great deal more about their use and care. And the ink still works fine. I like a smooth fine line, but I have only a couple of medium nibs sitting around - only the royal blue uses a medium. Yes, I know you've heard of $1000+ fountain pens. Just like I've heard or seen Maserati, Bugatti, Jaguar and Ferrari cars. Same deal. Some of that is very fancy artsy stuff, some is The Name to impress people by the cash you blew on it and to somehow get status and babes with it. Sheesh. 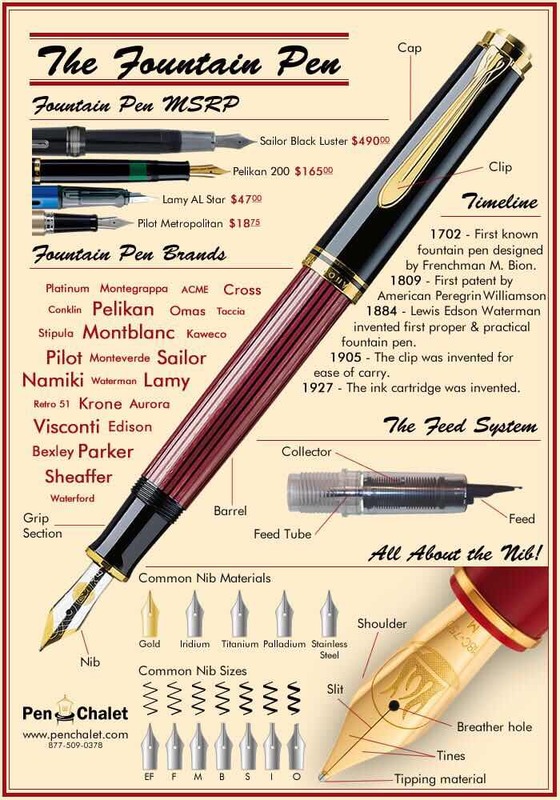 I don't think I've heard or seen of a pen that is over $150 that I would ever want, and the great bulk of pens sold are less than $50. And you hang on to good fountain pens (with very simple care) for a very long time, unless your local no-brain-strong-jaws animals use it as a chew toy of sorts. Almost all inks sold are washable, and only a few are more permanent- the sort of thing you'd use for legal documents and the like, and they're not that expensive either. We're talking $6 to $13 dollars a bottle good for years of heavy use in writing or drawing - washable or not washable. Why do I like fountain pens? The smoothness and ease of writing, the clarity and solidity of the line, the profound coloring and the strong saturation of the ink. I find very very few rollerball or gel pens that come anywhere close to this - I like the Tul pens that Office Depot/Max sells, and those I recommend to people all the time. But this stuff is way superior to that. In short, the good fountain pen doesn't get in the way of the fluidity of your writing - it often *helps it along* to move as you think and compose in your head. Just my ten cents on the matter. And no, I do *not* think of fountain pens as a status symbol - it's an inexpensive tool that is cheap, a solid performer and makes my hardwriting scads easier. I'm not any kind of speed typist, lemme tell you! Yay, rah, Bunyips! Yip yippee! Back again, this time for good; had lots of work to do since retiring last January and not a ton of free time. Well, first things first…since I’ve been away for a while, I need to bring y’all back up to speed as to what’s going on here (or what *has* been going on here) but I figured I’d mix that in with more current stuff on my pointy head; simpler than trying to do one completely and then the other. I’ll tag the old news Throwback so you can see it all in one group if you want to, and Go On with the rest as it happens. Major foot surgery related to that that came from my left foot having major chunks taken out of it that were infected, including the 5th metatarsal bone, which first required months in a rehab nursing home to get me up and going again – and now, messes me up majorly on balance and walking. It’s now much more a chore to walk around, and my weird gait has gotten some substantial complaints from my leg and back muscles – right now, I’m on muscle relaxants to un-twist things in my legs, which had gotten horribly painful. chronic ill / tired episodes, exacerbated by (1) and (2) above, which led to me not getting things done in any sort of schedule and made me feel really overwhelmed which led to depression (and me going into a spiral on same). Yadda yadda. Who wants to write endlessly about all of the above, which have swallowed your life whole? And if you did, with all the stuff you have to do/dig through that has built up, can you justify the time involved? I’ve been able to toss out some stuff for Facebook, but it’s almost all been light stuff I can toss off without a lot of time or thought. I miss doing something with some meat on it. Journal coming back from the dead. No ghost involved. Will haunt you anyway. Though I felt like crap much of the evening, with a temp of just under 100F; not sure if I have a new set of infection in my body, but will have to wait and see tomorrow, etc. Over the last ten days or so, I’ve been feeling moderately rocky – and over this weekend, *very* rocky. I’m really not sure what’s going on, but it’s gotten bad enough that I’m going in to see my GP doctor to see if she has a clue. A little later, I started to notice other things happening; shortness of breath, lack of energy, way lower ability to deal with heat – sweating like mad and quick energy loss. Since I had a new prescription for the ADD meds filled on Thursday, all this went off the charts, and half of Saturday and all of Sunday, the problems with shortness of breath really kicked in – *any* effort to do stuff made me out of breath and energyless. I managed with difficulty to put away lunch leftovers and gather and run a tub of dishes, over several hours, and it really knocked me on my keister. By mid-afternoon Sunday, it was pretty clear that I was seriously ill in some manner, and took my temperature – normal. I got on the Internet and set up an appointment with my GP doctor for 11 am on Monday, and can Elle’s my other commitments for Monday, including work. A couple of really dire thoughts – a major change with my leukemia or cancer of the esophagus – came through my mind, but I just don’t know WTF is going on. I desperately need a new wallet and belt; both have been beat to pudding. Something roughly similar would work; this wallet on Amazon looks decent, and the belt (new) has to be shorter than this one- as I’ve lost weight, I now have way too much slack at the end. In the very near future, I will have to get a new pair of swimming trunks. Nice idea. In the near future, I’m finally expanding on my Radio interests, and my first step is to get an antenna set up outside for the shortwave/AM/FM setup. Need an antenna to hear things better on whatever device you have. I also want to get a SDR Radio – a new type of radio that enables you to see what’s on…it samples the *entire* band of frequencies constantly and you run it through a PC; you’ll see a ‘waterfall’ of what’s on now in that section of the universe, and tuning to the right thing is a serious snap. An example of this is a radio set up for public use by students at the University of Twente in the Netherlands (the link is a live control for the radio, which can be simultaneously used by hundreds of users for free), and fooling with that site at odd times has *really* stirred me up to return to my radio roots – to the point of getting my Ham license. I stalled on that for decades because my brain can’t process Morse Code nohow no way. Note: I have a reasonably decent standard shortwave set, but the SDR radio I’m looking at getting is this one or (if I can learn to build a kit) this much cheaper one. (Also, the cheaper one doesn’t cover longwave or Mediumwave / AM Broadcast, which doesn’t thrill me.) Of course, that radio’s a serious chunk of change – rather put money into the antenna first. I need a voice recording microphone; I’ve had two of these, and they were too fragile and too difficult to fool with. Something like this would be far nicer. My family used to despair that all I was interested in were books and DVDs. I mean, I could use some pine or cedar soaps, but I take care of myself on the book and DVD end of things anymore, and I don’t ask. Lot more fun doing things and going places, in general. I have most of the things I want or need. The village of Lisle is out in front of our house doing some sort of road conditioning, and the dogs are going nuts over the people and noise, with lots of screaming and ranting. I work in the basement in my office, but Jack, my daughter's miniature poodle. has the most piercing and endless screams, yelps and barks, never failing to set my teeth on edge. Gaah. Only thing that's worse is when the local rabbit population decide to taunt the dogs by doing everything but dancing the hora while collectively giving the middle finger to the dogs. It gets Meredith really mad at the rabbits! Dangitt, now I have 'Havah Nagiilah' stuck in my head as an earworm! !